At the height of the Import Tuner scene (think the release of The Fast and the Furious in 2001), Japanese workshops like JUN and Top Secret were the leading names, having developed a reputation for automotive perfection and always raising the bar. 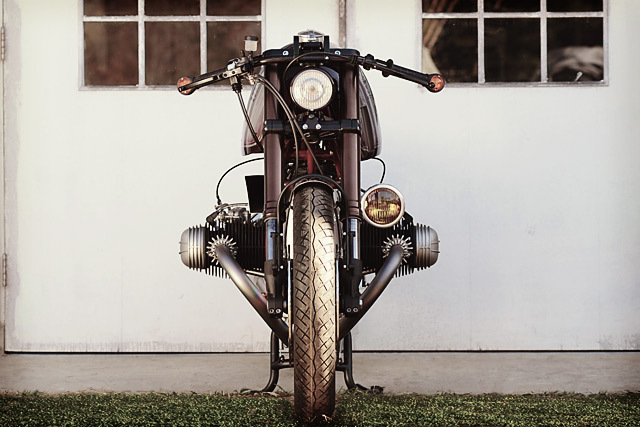 With the custom motorcycle scene now well and truly thriving and arguably having past where the Tuner scene was at, it is once again Japanese builders like AC Sanctuary and the now US-based Shinya Kimura whose efforts often leave you speechless. Well, you can add to the list one ‘Shiro Nakajima’ who used to build incredible bikes for Ritmo Sereno, which he founded but has since left. Since then he’s set up a new workshop known as 46Works at the base of Mt. Yatsugatake, where he has returned to his roots of brilliant one-off machines, incredible fabrication and the odd bit of furniture making thrown in for good measure. Here’s his latest. 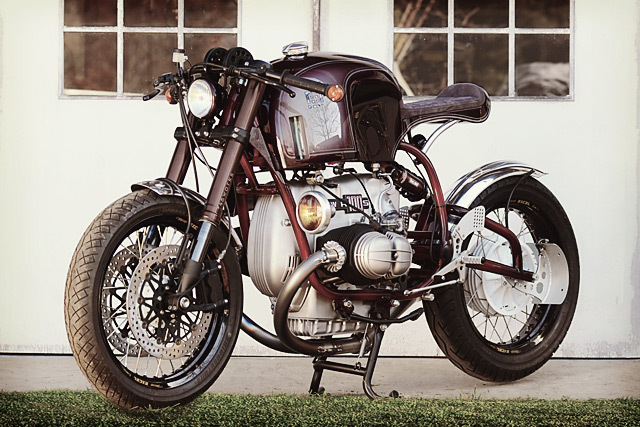 His latest project is this 1976 BMW R100S, well that’s what it used to be, it’s now nothing like the original and is one of the most comprehensive R series builds you’re ever likely to see; it’s stunning! 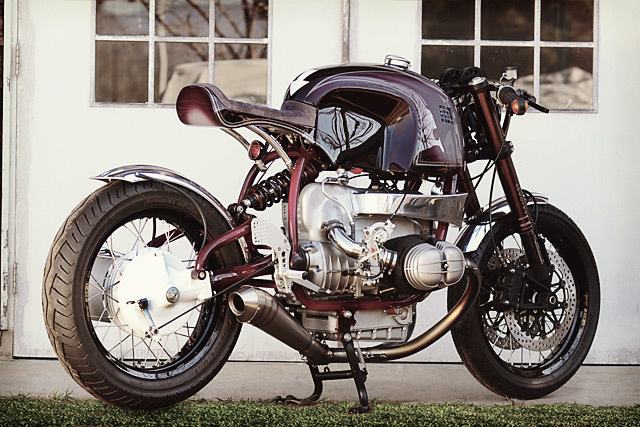 No stranger to the Bavarian brand Nakajima was chosen by BMW to build a custom RnineT when the model was launched. To start this build the bike was completely dismantled right down to the last bolt and only items in the best of condition reused. The frame was freed of its paint and smoothed to perfection before being set aside until the tins were done. The subframe was cut off and Nakajima bent and welded a minimalist new item from raw aluminium that then bolts to the frame. 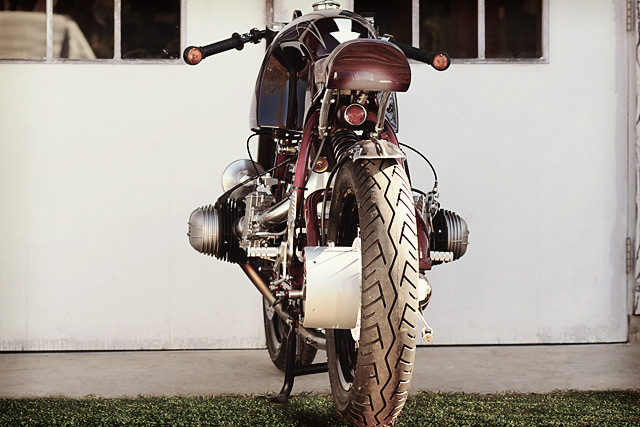 He then set about crafting the metal work and it is flawless, the tank is his own interpretation of the legendary Heinrich items but with bolder, more alien features that also include a recessed fuel sight tube, incredible knee dents and all topped off with a hand turned Monza cap. The seat cowl was then fabricated from aluminium to match the lines of the tank but to deliberately make the front end the geometric focus. With such amazing metal work it would be criminal to throw a basic paint job over it so the task of laying down the colour was given to the enigmatic one man operation known as Stupid Crown. A by appointment only paint shop, the resident artist laid the base coat over the frame, swingarm, tank and cowl before wielding his paint guns like six shooters to create the spectacular finish that includes Black, Deep Cherry Red, Gray and a host of other colours before finishing off the top with some personalised graphics. 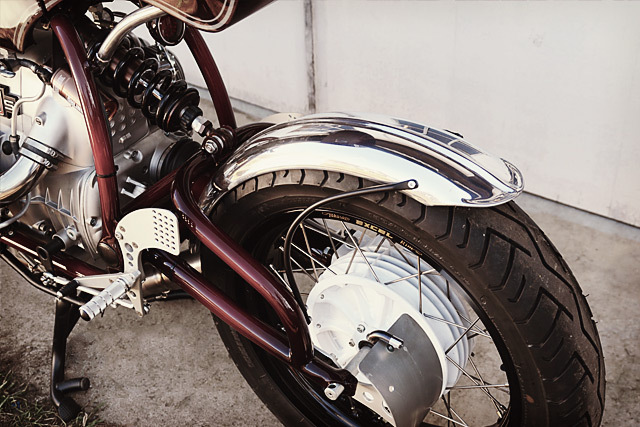 Again to allow the tank to take centre stage the fenders, mounted with black painted round bar, were heavily polished along with many of the other aluminium parts on the bike. 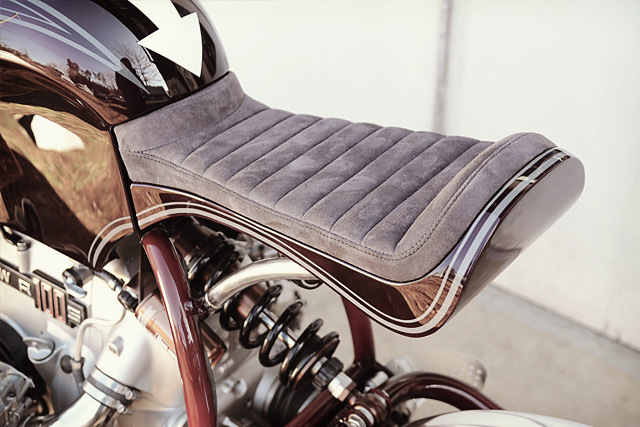 With the paint work done another small workshop of exceptional skill, razzle-dazzle, took their very best cowhide and crafted out a seat that is so perfectly integrated into the motorcycle it’s hard to see how better work is even possible. To say that Nakajima builds a mean engine is an understatement and they not only go like hell but look incredible while doing it. The big bore BMW engine of some 980cc now slings a pair of high-compression pistons inside the thoroughly detailed boxer block. The chambers are filled with FCR flat slide carbs for increased fuelling and snappy throttle response. Rather than feed them with pod filters the standard airbox remains in place but a hand-made aluminium ram air duct drastically increases air flow. The NOS heads hold one of the nicest exhausts you’re ever likely to see, Nakajima hand formed a full titanium system that is a 2 into 1 design that finishes with a hand crafted GP style muffler again made from high quality titanium. To bring the electrics into the modern era products from EnDuraLast, Dyna and Boyer are used to ensure maximum spark and bring 21st century reliability to a forty-year old machine. It’s safe to say this is one of the more powerful R100 engines and aiding its ability to rev is a machine lightened flywheel that is helped by a beefed up gearset from a ’90s model. All the power is not much good if you have to slam on the anchors at the first corner you come to and Nakajima has more than compensated with the suspension design and execution. The front end is taken from a BMW RnineT which consists of 46mm USD telescopic forks and are light years ahead of the original items. 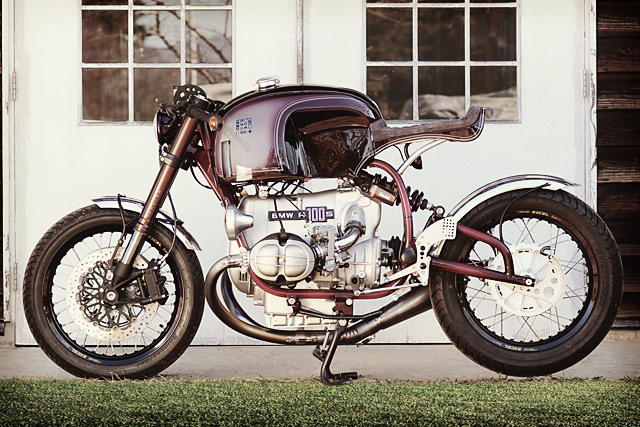 The rear could simply have been given a set of upgraded shocks, but this bike is about precise perfection so Nakajima fabricated a cantilever swingarm that now supports a one-off Ohlins shock. The brakes are of course Brembo because only the best will do, with twin rotors on the front end clamped by Brembo calipers with the big Italian also supplying the master cylinder. At first look you might assume the bars are clip-ons, I certainly did, but they are in fact a single hand bent piece that are attached to the top tree by creating custom inverted risers. At their ends are the turn signals and new grips with POSH providing the mini switchblocks for an incredibly clean finish. 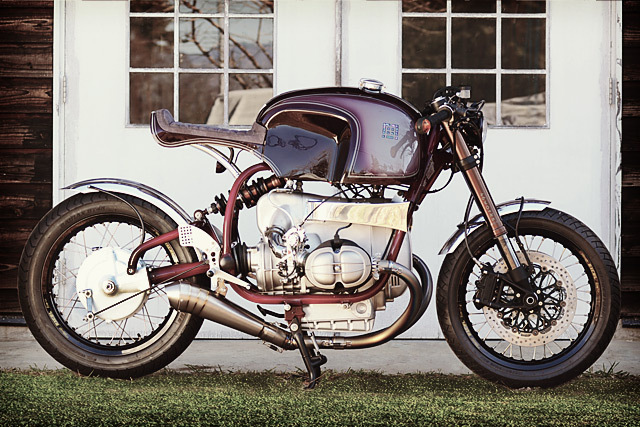 Providing the vital information is a tiny Motogadget speedo and lighting comes courtesy of a small Motor Rock headlight and a tiny Deus tail light tucked away under the seat, with the unique touch of a fog light mounted to the bikes left side. Having searched for a set of rearsets that took his fancy Nakajima decided the best way to get the look and feel he was after was to simply fabricate them himself and they are of world-class quality. The finishing touch was to get his masterpiece rolling and the factory wheels from 1976 just weren’t an option. Instead the RnineT front hub is laced to an Excel rim and the factory BMW rear hub has been given the same spoked treatment, modified, before accepting its own lightweight Excel rim. Both front and rear are wrapped in Bridgestone Battlax BT45 rubber and with that this incredible bike can be kicked off the centre stand and taken for a blast. 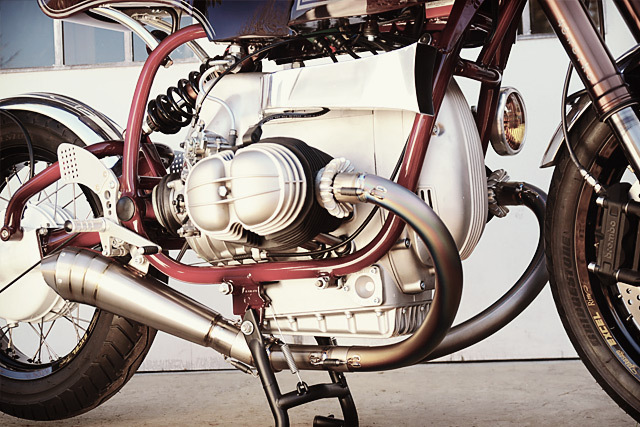 As journalists we are supposed to remain objective at all times, but as I flick through the photos of what Shiro Nakajima has crafted with his own hands I can only say that I am now a huge fan, that exhaust, a custom paint Ohlins shock on a hand-built swingarm… Mind blown and I cannot wait to see what rolls out of 46Works next.